In the age of progressive human civilization and cutthroat competition, it is quite evident that every service organization has to strive in achieving better customer experience by being at par with technological advancements. According to Gartner, 25% of customer service and support operations will integrate virtual customer assistant (VCA) or chatbot technology across engagement channels by 2020, up from less than 2% in 2017. While 84% of organizations expected to increase investments in customer experience (CX) technology in the year ahead, Chatbots are increasingly becoming the best form of online communication between brands and consumers. You would never like to wait in queue for agents to attain your service requests or raise a ticket from your behalf. Being a service-centric organization, it’s always disappointing if a customers’ query is un-attended because of your agent’s bandwidth. Here comes Bot’s role to simplify your job. A bot is nothing more than a computer program that automates certain tasks, typically by chatting with a user through a conversational interface. Imagine if you wanted to buy shoes online. Normally you would go to a shopping portal. Then look through its online catalog and order shoes that you like. The Chatbot will then tell and suggest to you what you want. There are different types of chatbots available in the market. Chatbots today come in all shapes and sizes and have varying levels of capabilities. While basic chatbots may be adequate for most scenarios, some scenarios require more advanced chatbots. Menu/button-based chatbots are the most basic type of chatbot on the market today. In most cases, these chatbots are glorified decision tree hierarchies/ grid presented to the user in the form of buttons for easy selections. Similar to the automated phone menus we all interact with on almost a daily basis, these chatbots require the user to make several selections to dig deeper towards the ultimate answer. Unlike menu-based chatbots, keyword recognition-based chatbots can listen to what users type and respond appropriately, or at least try to. These chatbots utilize customizable keywords and AI to determine how to serve an appropriate response to the user. For example, if a user asked the question ‘How do I configure Eloqua users’ security groups?’, the bot would likely use the keywords ‘Eloqua’, ‘user’, ‘security’, and ‘group’ to best determine which answer to respond with. 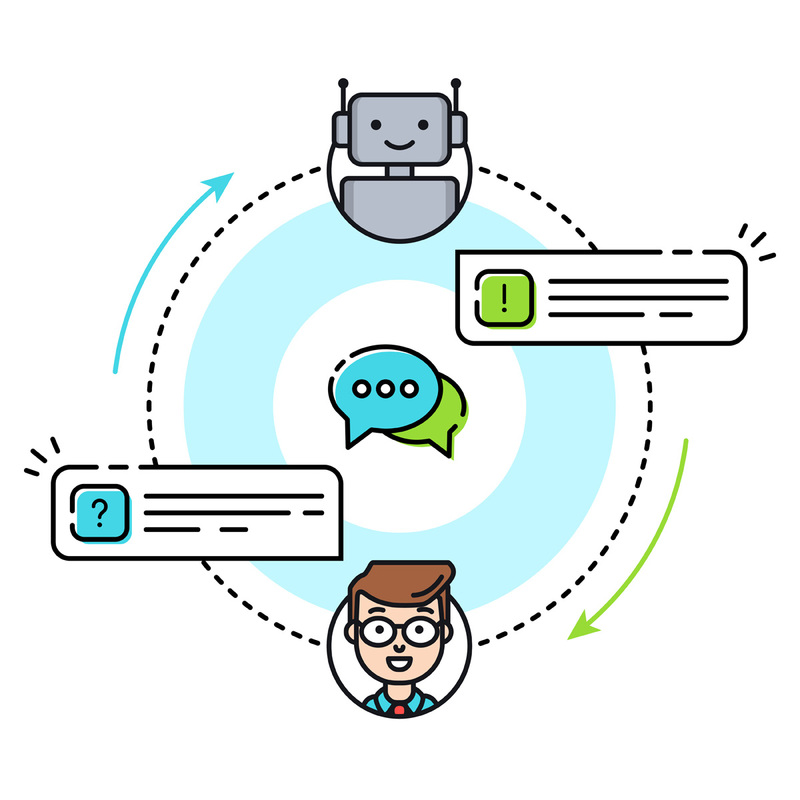 Contextual chatbots utilize Natural Language Processing (NLP), Machine Learning (ML) and Artificial Intelligence (AI) to remember conversations with specific users to learn and grow over time. Unlike keyword recognition-based chatbots, contextual chatbots are smart enough to self-improve based on what users are asking for and how they are asking it. For example, a voice-controlled smart assistant like Google Assistant lets you do things like sending messages, check appointments and so on your Android device, just like Apple’s Siri on an iPhone or iPad, but reaching far beyond that, with a bot-centric AI experience, designed to give you conversational interactions. If you have ever encountered with a pizza ordering Bot, you possibly have understood how this contextual bot works in providing particular value such as the delivery of a hot, delicious pizza in less time than before. Marriott International allows its Rewards Members to search through 4,700 hotels and book rooms for their upcoming trips. Marriot International Chatbot allows interaction through Facebook Messenger and Slack. Customer assistance success rate has been 44%. Sephora is a global phenomenon in the beauty community with its flagship stores in the US and worldwide. Their Virtual Artist Chatbot uses a customer’s selfie to recommend makeup and skincare items. With more than 4 million hits under their belt, it’s safe to say that this AI Chatbot has done its job. Allstate Business Insurance expert (or ABIe) is Allstate’s solution for jammed inquiry lines. It uses customers interested in their small business commercial insurance program. This AI Chatbot handles in excess of 12,000 inquiries from agents. Despite the advantages of using chatbots to automate simple, repetitive interactions, humans are more important than ever. Why? Because as self-service automates the easy interactions, the complex issues must be handled effectively by human customer service. No matter how advanced your chatbot’s AI and NLP capabilities are or how much attention you’ve paid to its design, there are bound to be moments where it stumbles. In some cases, these moments aren’t even the chatbot’s fault and are more so related to users not using the chatbot correctly or having false expectations regarding what it knows. Your chatbot should have an option to allows users to indicate their need for a human or give a flag off to the human counterpart. But, always remember that the ultimate goal is to be able to reduce the need and frequency at which your users require a human. Gartner predicted 30% of all B2B companies will employ AI to augment at least one of their primary sales processes by 2020. Are you one of them?